On Monday, I promised to share formative assessments that mesh well with the Common Core. 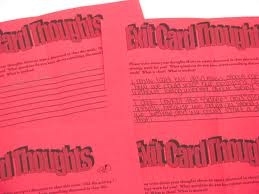 I think one of the easiest formative assessments to start with is the use of exit cards. For those of you who have never tried this technique before, an exit card is a blank index card that you give to students before wrapping up a lesson. Ask them to share their thoughts (anonymously if they like) on the card and hand it to you as they leave. To begin with, you might want to give students a specific question to focus their feedback. As they become more experienced with exit cards, you can simply ask for their thoughts and opinions on a particular topic or aspect of the lesson. My sixth-graders especially like when I use blank Post-Its as my exit cards and allow them to stick their Post-Its to the door or doorjamb as they leave. What I like about combining this technique with the Common Core, is that the knowledge that I'll be giving students the freedom to express themselves in the exit card makes it easier for me to continually direct them back to the text during a close read. If we are reading an article and students want to discuss some personal thoughts or experiences that are off text, I can say, "Write down what you'd like to discuss more on a different day. Today we are just going to discuss the text and the evidence we can draw from it."